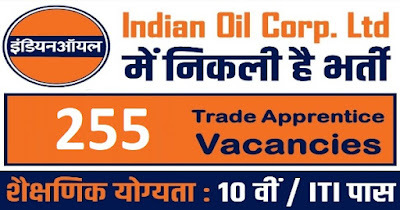 Apply online application to IOCL Recruitment 2018 255 Trade/ Technical Apprentice, Account Apprentice. 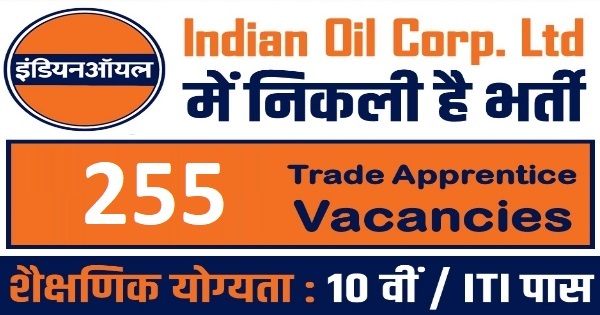 Indian Oil Corporation Limited (IOCL) Recruitment Board, latest notification for Trade/ Technical Apprentice, Account Apprentice. Applicants can get full advertisement below and submit the IOCL online application at www.iocl.com. Applicants who are going to apply, ensure IOCL jobs that you are eligible for post of Trade/ Technical Apprentice, Account Apprentice. The applicants will have to apply online, no other option. The last date of submitting online application is 25.02.2018. IOCL notification further information such as eligibility criteria, IOCL admit card syllabus and how to apply etc. listed below. Selection: Written Test and Personal Interview. 1. The Selection process would consist of two stages i.e. written test. The Written Test will comprise of 100 questions and shall be of 90 minutes duration & would mainly comprise of objective type questions. The questions would be in bilingual i.e. English & Hindi. The written test would carry a weight age of 85% and the weight age for interview will be 15%. The candidates will have to qualify successfully through each stage of the selection process i.e. Written Test and Personal Interview (Minimum 40%, relatable by 5% for candidates from SC/ST/Pw BD categories against reserved positions) and Pre-employment medical fitness for being adjudged suitable for engagement. Cutoff date: The candidate must possess the prescribed qualification, age etc. as on 31.01.2018. Age Limit: candidate Minimum 18 Years Maximum 24 Years.as on 31.01.2018. (Relatable by 5 years for SC/ST i.e. up to a max of 29 yrs., 3 years for OBC i.e. up to a max of 27 yrs., for the posts reserved for them). Candidates belonging to Pw BD categories shall be given age relaxation up to 10 years (up to 15 years for SC/ST and up to 13 years for OBC (Non Creamy layer) candidates. Payment of application fee can made through IOCL Apprentice Recruitment 2018 Only Fill the Online Application Form. How to apply: Eligible applicant require to apply online through IOCL Recruitment 2018 website www.iocl.com from 25.02.2018. 1. The candidates meeting the prescribed eligibility criteria may apply online from through the link which will be provided in our corporate website www.iocl.com (Careers-> Apprenticeships-> Engagement of Technical and Non-Technical Trade & Technician Apprentices in Northern Region (Marketing Division)-FY 2017-18. Only Online mode of applications will be accepted. 2. After filling up the online application ,the scanned copy of the latest colour photograph, scanned copy of the documents namely proof of date of birth (Xth Std certificate/mark sheet), prescribed educational qualification, caste certificate as applicable and signature to be uploaded without fail. In the absence of any single document, the application shall be summarily rejected. Eligible candidates will be intimated by email/sms for downloading admit card for the written test. a) Xth std /SSLC /Matriculation certificate /mark sheet issued by the concerned education board as proof of date of birth. No other document will be accepted for verification of date of birth. b) Latest Caste certificate by reserved category candidates in the Performa prescribed by the Govt. and issued by Competent Authority only. certificate (not more than 6 months old) in the Performa prescribed by Govt. of India, which would, among others, specifically mention that the candidate does not belong to the persons/sections (creamy layer) as mentioned in column 3 of the schedule to the Department of Personnel & Training, Government of India OM NO.36012/22/93-Estt. (SCT) dated 08.09.1993. Candidates belonging to OBC category but falling in creamy layer are not entitled to OBC reservation benefits. Accordingly, such candidates may choose to apply for the positions provided they meet the age criteria applicable to UR candidates and indicate their category as “UR”. Indian Oil Corporation Ltd. (Northern Region) being a Central Public Sector Undertaking, only those communities that are mentioned in the common list of OBC approved by Central Government shall be treated as OBC for the purpose of reservation. d) Certificate from the Institute stating that the candidate has pursued through regular mode and the year of passing. e) Semester-wise / year-wise mark sheets of ITI (NCVT) / Graduation/Diploma in Engineering. 1. Log on to the Indian Oil Corporation Limited (IOCL) website www.chandigarhpolice.nic.in. 6. Make the payment by IOCL Apprentice Recruitment 2018 Only Fill the Online Application Form. Applicants have great chance to get jobs Indian Oil Corporation Limited (IOCL) Recruitment, however if someone want to ask anything please comment below.